After you read our post about transformational resolutions, you may be thinking about what you can do to meet and connect with new people. 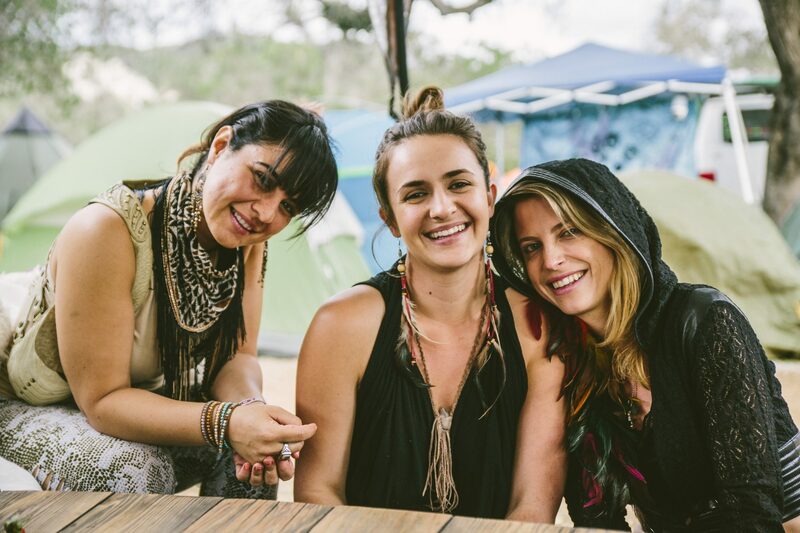 One of the best things about a festival like Lucidity is that it attracts open-minded people like you. 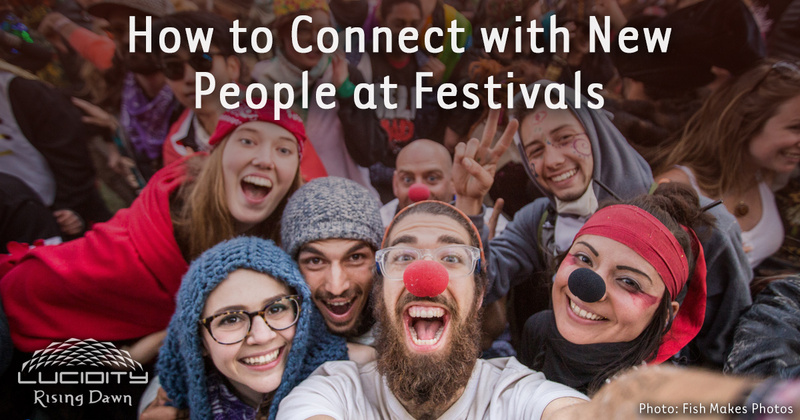 This can be a great opportunity to meet new people and grow your tribe. But if you’re like most people, you may be intimidated by the idea of walking up to someone new and striking up a conversation. Let’s break down how to find someone new to connect with, then I’ll give you tips on how to get the conversation going. Step one: you need to find someone who wants to have a conversation! Lucky for you, festivals are full of people who are in a relaxed state of mind and are more likely to want to connect. The best way to show people that you’re open to connecting is by smiling and making eye contact. Bonus: a smile is the easiest (and most affordable) gift you can give someone. If someone smiles in return, it’s likely that they’re open to having a conversation with you. Some people find it easier to connect with people over an activity. Do you like to hoop? Find another hooper and ask them if they would be open to trading tricks. Are you an artist? Look for someone who is doing the type of art you resonate with and give them a compliment. 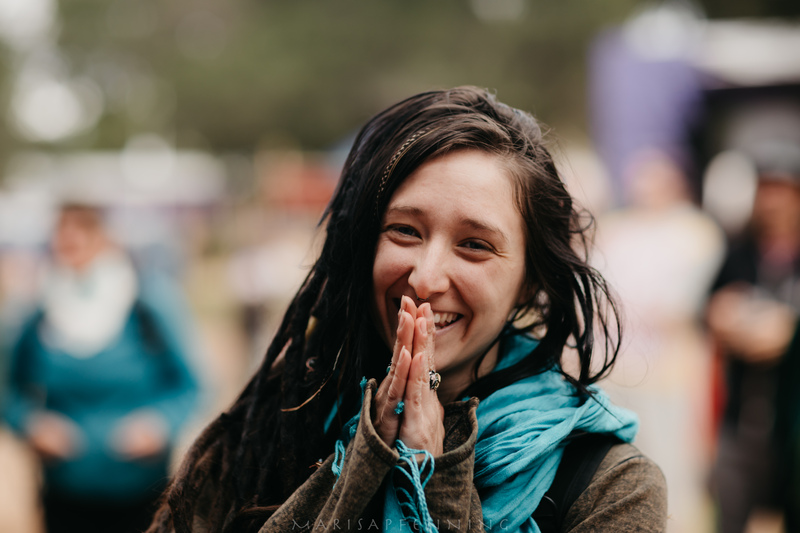 Another great way to find like-minded people at Lucidity is by checking out an environment, activity, or workshop that sounds interesting to you. These are great places to find new people who share your interests. If you meet someone new but you’re tongue is tied and you don’t know where to go from there, try one of these conversation starters. Once you get the conversation going, keep it going by asking a follow up question based on your new friend’s response. The most important thing to remember is to be curious and open-minded. Here are our favorite conversation starters. Leave a comment if you have another one that works for you! How is your festival going so far? This is my go-to first question to ask. It allows people to talk about something that is very relevant and fresh in their mind. It also gives you the opportunity to compare experiences and share stories of how you got there. Have you been to Lucidity before? This is another great question for early in the conversation because it helps set the stage for deeper discussion. If this is their first time, you can share newbie stories. If they’ve been every year, you can ask for their sage advice. What do you think about this art/artist/environment? Lucidity is full of so many different kinds of art. Everywhere you go, there’s something to see, hear, or do. Pick something nearby and ask your new friend for their opinion. Do you have a favorite musical artist?Some people know every artist at every festival and others may be experiencing them for the first time. Asking them if they have a favorite gives them an opportunity to say “No, I’ve never heard anyone here before”, and this opens the door for you to ask about their music tastes and possibly offer a recommendation. I love your hat/shirt/belt! Where did you get it? Starting with a compliment is a great way to warm up a conversation. Personal style is one of the many ways people express themselves. Who knows, maybe they made it themselves and that’s their passion! Have you tried any of the food vendors? Everyone’s gotta eat! And the food vendors at Lucidity are conveniently located near the main stage so even if you haven’t been to a vendor, you’ve probably seen one that looks tasty. You can ask your new friend for a recommendation. Do you like to read? Have you read any good books lately? If someone is a reader, they most likely have something to say about their latest read. If they don’t read often, you could follow up by asking them if they like movies or podcasts. What’s your favorite weekend activity when you’re not at a festival? Talking about leisure activities can be more comfortable than talking about work for many people. You’re also more likely to find common interests related to how you spend your free time. What made you decide to come to Lucidity? People have many different reasons for attending a festival like Lucidity. You may find this opens doors to talking about deeper topics like spirituality and life purpose. If you could pick anyone, who would you like to have dinner with, and why? Find out who your new friend wants to spend time with. This can help you learn more about their personality and who they look up to. What do you want to be known for? This is a great question for when you’re ready to take the conversation a bit deeper. I usually save this one for after I’ve been talking to someone for a while. This can open the door to much deeper conversations about what they value and what their life goals are. If you could plan the perfect day, what would it look like? This lets your new friend tell you about all of their favorite things, and it’ll probably put them in a good mood thinking about it. You could inadvertently inspire them to do more of something they love. Win, win! What is your favorite thing about yourself? People love to talk about themselves, and I don’t mean this in a narcissistic way. People are generally more comfortable talking about the things they know very well. Don’t forget to ask follow up questions! Hopefully these questions will help spark some delightful conversations at Lucidity: Rising Dawn, and perhaps even lead to a new friendship or three! ← Apply for a Lucid University CourseWeek Scholarship!